Tensions rose in Egypt as former president Hosni Mubarak was given a life sentence for failing to stop the killing of protesters during last year's uprising - but was cleared, along with his sons, of corruption charges. By nightfall, a large crowd of up to 10,000 had gathered in Cairo's Tahrir Square, the birthplace of the uprising which led to Mubarak's removal, to vent anger over the acquittals. Similar protests began in the Mediterranean port city of Alexandria and Suez on the Red Sea. Ramadan Ahmed, whose son was killed on January 28, the bloodiest day of last year's uprising, said outside the courthouse: "Justice was not served. This is a sham." The case against Mubarak, his sons and top aides was very limited in scope, focusing only on the uprising's first few days and two narrow corruption cases. The case was never going to provide a full accountability of wrongdoing under Mubarak's three decades of authoritarian rule, enforced by a brutal police force and a coterie of businessmen linked to the regime who amassed wealth while nearly half of Egypt's estimated 85 million people lived in poverty. Mubarak, 84, and his ex-security chief Habib el-Adly were both convicted of complicity in the killings of some 900 protesters and received life sentences. Six top police commanders were acquitted of the same charge, with chief Judge Ahmed Rifaat saying there was a lack of concrete evidence. That absolved the only other representatives of Mubarak's hated security forces aside from el-Adly. It was a stark reminder that though the head has been removed, the body of the security apparatus is largely untouched by genuine reform or purges since Mubarak was ousted 15 months ago. Many of the senior security officials in charge during the uprising and the Mubarak regime are still in the same roles. In many ways, the old system remains in place and the clearest example of that is a key regime figure - Mubarak's long-time friend and last prime minister Ahmed Shafiq - is one of two candidates going to the presidential runoff set for June 16-17. Last night, Mr Shafiq's campaign headquarters in the cities of Fayyoum and Hurghada were attacked and damaged. The generals who took over from Mubarak have not shown a will for vigorously prosecuting the old regime. That is something that neither Mr Shafiq nor his challenger Mohammed Morsi, may have the political will or the muscle to change when one is elected president. Mr Shafiq last week declared himself an admirer of the uprising, calling it a "religious revolution". He said today that the court verdict showed that no-one was above the law in modern Egypt. Mr Morsi, of the fundamentalist Muslim Brotherhood, quickly tried to capitalise on the anger over the acquittals, vowing in a news conference that, if elected, he would retry Mubarak along with former regime officials suspected of involvement in killing protesters. 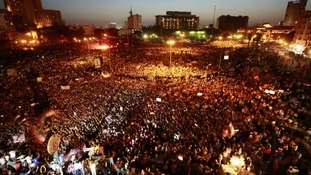 "Egypt and its revolutionary sons will continue their revolution. This revolution will not stop," he said. Mubarak and his two sons were acquitted of corruption charges, along with family friend Hussein Salem, who is on the run. The corruption charges were related to the purchase by the Mubaraks of five villas built by Salem at a fraction of their price and Mubarak's decree to allow a Salem company to export natural gas to Israel. Rifaat cited a 10-year statute of limitations that had lapsed on the case of the villas. Despite the acquittals, Mubarak's sons - one-time heir apparent Gamal and wealthy businessman Alaa - will not be freed because they are awaiting trial on charges of insider trading. They have been held in custody in Torah prison, the same jail where Mubarak was flown after the sentencing. The charges related to killing protesters carried a possible death sentence that the judge chose not to impose, opting instead to send Mubarak to prison for the rest of his life. After the sentencing, Mubarak suffered a "health crisis" on a helicopter flight to a Cairo prison hospital, security officials said. One state media report said it was a heart attack, but that could not immediately be confirmed.